Hi peeps! It's Traci from Dragonflies in First, here! It's also nearly the end of April! I cannot. I can.not. Time is FLYING! For me that also means I'm neck deep into Open House activities. Here is SoCal we do an "Open House" near the end of the school year. This is when the kiddos bring their parents to school during the EVENING and show off all their wonderful work. We make our classroom into an underwater wonderland. I kinda love it. There is fabulous writing accompanying adorable sea creature crafts all over the walls. Jellyfish hanging from the ceiling. And class books on the tables. 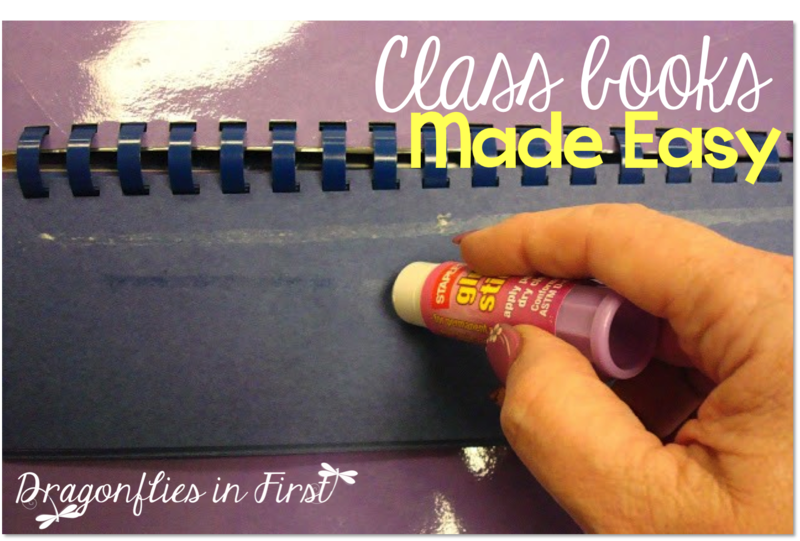 Do you make class books? 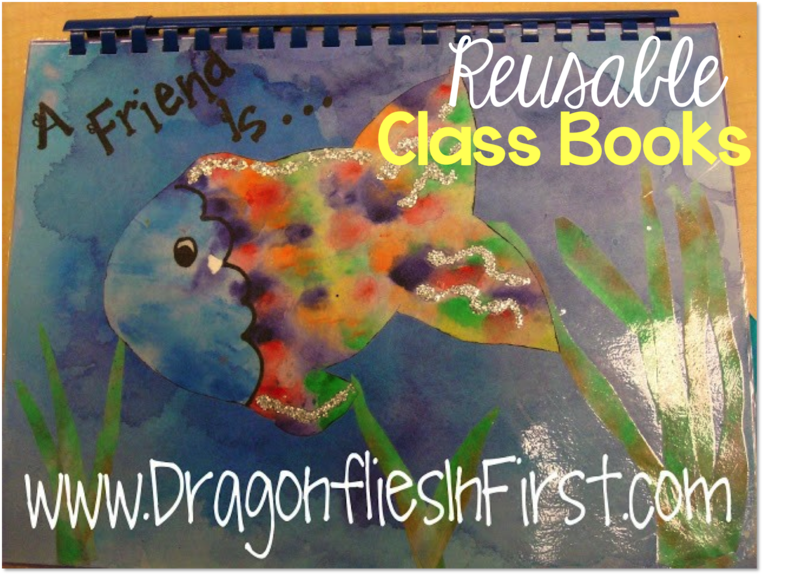 I wanted to share with you a little trick I use to create QUICK and EASY REUSABLE class books. This is from a piece I originally posted on my blog awhile back. 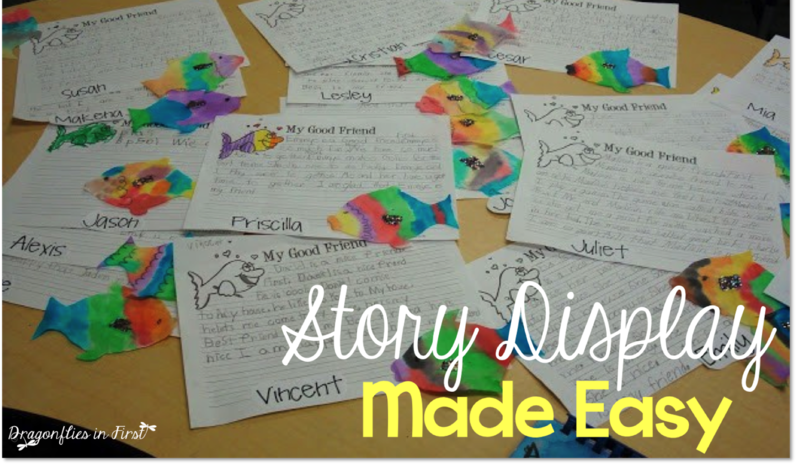 These are a bunch of WONDERFUL papers the kids wrote about their good friend... an activity we do based on Rainbow Fish. It includes a little water color fish art with a glittery, shimmery scale. With all the other ocean stuff we have going on, I simply have no room to put these up. So they are going in a class book that will be set out during Open House. I actually set a few class books out. Here is how I make the books. 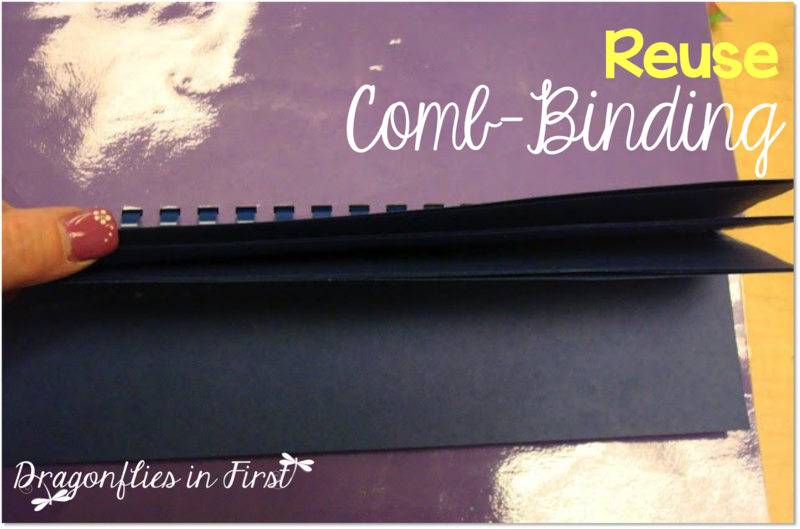 I use the same book every year (cover and comb) and just change the student work without having to hunt down that book binder, nor ruin the student work. It's bound with a comb binder. I place 30 pieces of construction paper (1 for each student) cut to size between the front and back cover then I comb bound all of those sheets along with the covers. This is now my permanent book. It is reused each year. Then set the students' written work on it. Repeat 30 times or whatever amount you need for your class size. 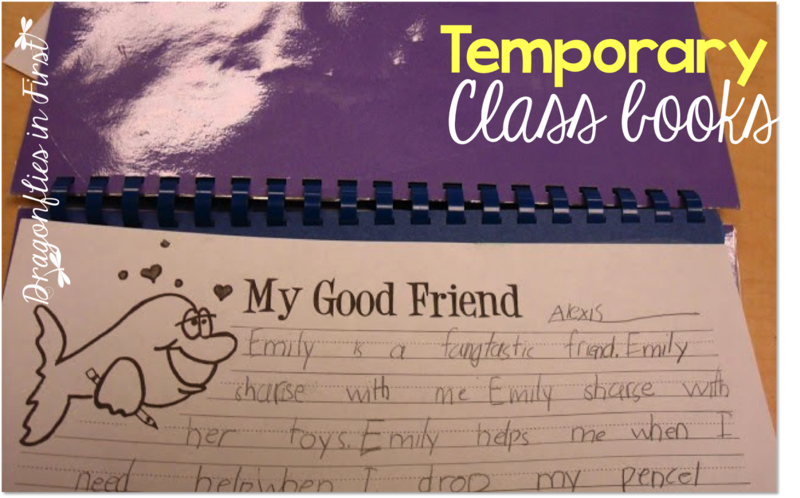 The papers peel off easily, so you can give the kids their work AND save your book for next year. You always cover up the construction in the book, so it's ok if there is a little glue left on the construction after removing the pages. No one but you will know it's there. 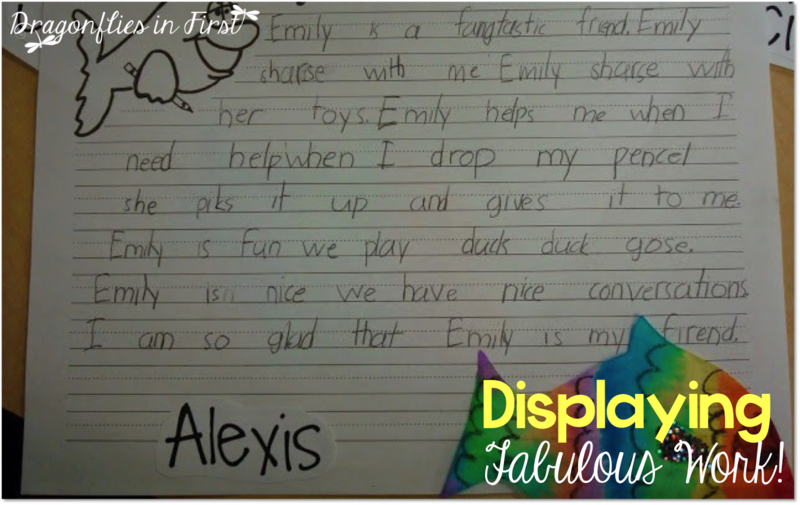 I love that Alexis wrote that she has "nice conversations" with Emily. How sweet is that? Seriously peeps, I am all about saving time and energy. Since this is a topic I have the kids write about each year, it only makes sense to re-use the cover and binding. This is so easy, I have even have students put it together for me! Enjoy the rest of your April! Our Favorite Mother's Day Ideas! Batter Up! It's baseball season! Thematic Writing Mats to Engage Your Students!